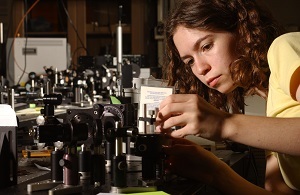 The School of Physics offers bachelor of science degrees in physics and applied physics. The undergraduate degrees are broad based with an initial emphasis on core topics such as classical and quantum mechanics, electromagnetism and thermodynamics. This is followed by a range of more specialized courses including atomic, solid state, optical, nuclear and particle physics; biophysics, astrophysics, nanoscience and relativity. Courses of general interest, such as astronomy, are also available. The relatively large number of physics majors (more than 100) allows for a wide range of courses to meet the interests of a diverse student group. Students are able to develop their own programs of study with the aid of faculty advisement. Approximately half of all physics majors progress to doctoral study at, either Georgia Tech or at other prestigious universities. Students may also go to graduate school in other disciplines such as electrical engineering and materials science, where a bachelor degree in physics is recognized as effective preparation. Other students choose to go into education, business and industry. Banking (economic forecasting) and oil exploration are among the many areas that seek physics majors. The Society of Physics Students at Georgia Tech provides a vibrant scholarly and social environment, as well as an introduction to the community of physicists. Activities such as general interest lectures, outreach, field trips and social functions allow students to interact with their peers and faculty members. For more information, please see www.physics.gatech.edu, or contact the School’s Undergraduate Coordinator, Professor Brian Kennedy (brian.kennedy@physics.gatech.edu).